It’s midnight and Muzeeyi Bizibu and his wife are meant to be asleep because they have to wake up at 5am to go to work. However, Muzeeyi Bizibu’s chest is yet again bothering him. He can’t seem to breathe well and is having coughing fits. It might be pneumonia. This is the third time in a year this is happening. The Bizubu family ponder what they can do. They’ve already used up their own savings dealing with the last few health issues they faced, and Mrs. Bizibu already asked the savings group she’s part of for money to deal with her three-month-old daughter’s fever during the rainy season. They now must wait for the expected harvest in two months before they can afford to pay for the visit to the clinic for Muzeeyi. Scenarios’ such as this are unfortunately typical for many Ugandans with young families and dependents. Further, about 48% of the population are dependent on agriculture, and 15% are casual laborers meaning they experience seasonality in their incomes which disappear quickly in the face of a backlog of expenditure and credit built up over time until they can sell their harvest or earn some money from short stints of work. In the face of crisis, many must rely on well-wishers and the kindness of their community for support; a resource that can be depleted too quickly. Insurance would be the true sustainable alternative in this scenario. Uganda’s insurance market is well-regulated with 31 insurance companies, 35 insurance brokers and over 1500 agents. Yet, formal uptake of insurance among adult Ugandans is incredibly low. Being able to plan and mitigate future risks is of universal concern. Formal insurance exists for this purpose. In Uganda however, most people seem to be comfortable without formal insurance, with only about 1 in every 100 Ugandans reporting having formal insurance cover risks faced to their health, business and life. Interestingly, FinScope 2018 found that while formal insurance uptake might be low, informal insurance is on the rise. Nearly 40% Ugandans, including the salaried, instead rely on informal mechanisms to deal with risks, as seen in the story of Muzeeyi Bizibu’s wife. Ugandans find more safety with village savings and loans groups -the main vehicle of informal insurance where funds in these groups are set aside to cater for emergency needs of their members. However, these informal mechanisms in the current form are limited both in the scope of what they can cover and how many people they can protect. Traditional insurance is designed to cater to salaried employees with scheduled insurance deductibles. Most people with insurance, besides the legally mandated motor third-party insurance, are covered as part of employment agreements. Traditional insurance may therefore not be suitable or appropriate for a populace in which only 3% of the adult population is employed in the formal sector, pushing majority of the traders, casual laborers, and the rest towards “self-insurance” leaving them highly vulnerable to perils that could plunge them deeper into poverty. The resultant mismatch between the supply of formal insurance services and the needs and demands of the people raises the question – What can we do to bridge this gap? 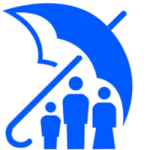 Worldwide, commercial insurers are extending insurance to low-income market segments. According to the International Labor Organization’s impact insurance facility, a little over 60% of the world’s largest insurance providers offer a microinsurance service covering over 500 million risks up from 139 million in 2009. Africa alone has seen an increase in adoption of microinsurance of 44.4 million people and properties covered in 39 countries between 2008 and 2012; a 200% increase in insurance uptake. Microinsurance is creating a unique opportunity for deep market penetration. The Philippines which was able to achieve 23% insurance coverage is an interesting example. The introduction of microinsurance products in the market in 2012 coupled with distribution innovation such as leveraging outlets that sold motorbikes, a popular medium of transport, to sell life and accident insurance policies bundled with the asset being purchased at low monthly payment rates saw an uptick in insurance rates. Similarly, in India, AIG sold microinsurance to women through a micro agent delivery model called Community Rural Insurance Groups. These groups help obtain trust in the community while reducing the overhead costs of distribution of microinsurance by leveraging community structures rather than sending agents on ground to sign up and support people to sign up for insurance policies. Closer to home in Rwanda, the digital health service company Babyl is leveraging artificial intelligence and mobile technology to better assess individual risk (one of the major trends in insurance technology – InsureTech) increasing the uptake of Rwanda’s recently passed universal health insurance scheme. With 2 million people registered, the service is accessible over both smart and feature phones and allows customers to make telephone consultations and receive recommendations on whether they should go to the clinic, helping reduce the anxiety of making an unnecessary trip to the clinic. After all, health insurance is of no consequence if no one is willing to utilize the services. By providing value upfront, people are more likely to spend a little more to go to a clinic and benefit from health care. These approaches are not exactly formal insurance products. They’re not business as usual but are a hybrid of traditional and non-traditional insurance and indicative of the type of outside the box thinking necessary to make insurance more palatable to the general public. These models are revisiting legacy business and distribution models while seeking to tailor products to the needs of the customers and winning their trust while at it. These are products that are designed for the masses, priced reasonably and leverage new distribution channels such as the mobile phone, whose penetration into the populace is far greater than physical infrastructure like roads and railways. Innovation such as these push the current boundaries of formal insurance and create new frontiers for the insurance industry. Uganda’s government has through the National financial Inclusion Strategy, made a commitment to increasing insurance uptake to 7% of the population by 2022. In an effort to make this a reality, the Insurance Regulatory Authority and Financial sector Deepening Uganda (FSDU) are partnering to create a regulatory framework that encourages market development through innovation. These two institutions have also partnered to issue the first ever domestic Microinsurance challenge fund, which will support innovative insurance solutions at different stages of product development and scale. This focus of the fund is to expand insurance services to previous underserved segments of the society including business owners, informal workers and farmers by covering their health, life and business risk needs. The microinsurance challenge fund is open to a broad range of financial service providers with innovative, testable and applicable solutions that will help increase formal insurance uptake in Uganda.